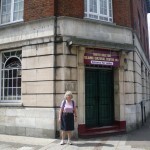 When we visited Erin Pizzey on Thursday, I mentioned the fact that we hadn’t seen much sign of real poverty in London. She suggested we go to Brixton, so we set off this morning, on the assumption that most of the really bad, dangerous people would probably not be out of bed yet. 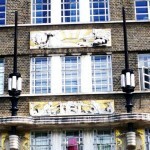 We did see a crime committed, but it was right outside our tube station in West Hampstead. A young man wearing a hoodie came running out of a liquor store and across the road without looking at the traffic, and sure enough the shopkeeper came running out after him. I had a brief fantasy of chasing after the guy, figuring I was almost certainly fitter than him, but then I imagined grabbing him by the arm and him smashing me over the head with the bottle and producing a knife. I immediately decided I’m not that much of a hero after all. We sympathised with the Indian shopkeeper, who couldn’t leave his store unattended even if he wanted to run after the thief. He told us he had lost a bottle of gin. Brixton was a much nicer place than we had imagined. 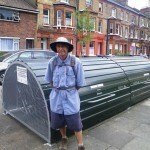 We walked up and down the high street and made a few detours down side roads without seeing any significant amounts of rubbish, derelict vehicals, or bloodstains on the footpath. I am sure these places do exist, in fact Erin told us there are some housing estates that the authorities consider “no go” areas, and police only visit in large numbers wearing riot gear. The local population has a lot more African and Carribean inhabitants than our part of London, and a few of them looked a bit dodgy, but there were also many familes dressed in their Sunday best heading to church. There were lots of middle class Europeans as well. We visited the Brixton Market, which was filled with cafes and food stalls selling interesting delicacies from all over the world, including Jamaican food that Felicity hasn’t seen since she lived there in the early 1980s. A young guy offered us a taste of English sausage, and we ended up buying some plus a couple of local cheeses. 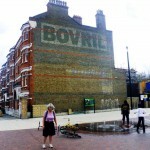 Outside the market, we spotted an old Bovril advert on a building that was made by the bricklayers, and therefore permanent. We also noticed that the local Islamic centre has a separate entrance for ladies. We were amused to look up at a row of terrace houses to see two women doing the dishes in their separate kitchens, just a metre apart, but it seemed a bit intrusive to take a photo. 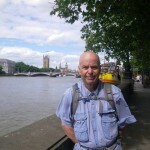 We continued our walk, discovered a neat under-cover secure bike parking place for local residents, and eventually found our way to the Thames at Vauxhall. The rest of the afternoon was spent strolling down the south bank of the river towards the city. 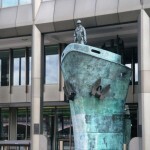 I was rather fascinated by the decorations on the London Fire Brigade building, and by a ship bow marking the International Maritime Organisation. 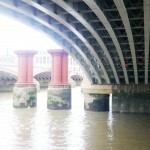 The final photo is under the Blackfriars bridge, and the orange blobs are painters hanging from wire slings. I am glad you were not feeling heroic John!